I'm a football nut. Love, love, love football. When I was in Dinkytown on Wednesday night for the Bob Schneider show, I drove my the new Gopher's football stadium. It is AMAZING!!! I mean, absolutely B-E-A-utiful!!! Because there are days I love college football... Well, let me clarify... 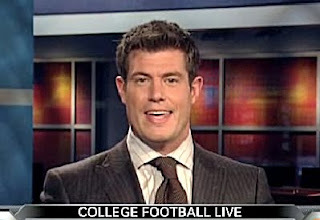 I love watching ESPN college football shows. Well, one show... 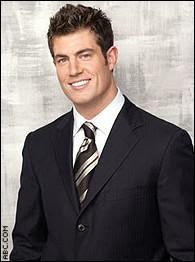 The one with Jesse Palmer. 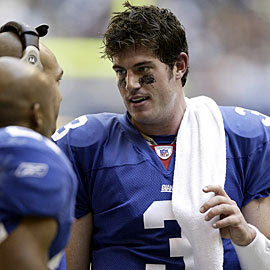 What I do know is that he used to play football for a little team called the New York Giants. And from there, I hear he played in the CFL for a minute. Inconsequential, if you ask me... You can't really see him with a helmet on. P.S. Mike, I didn't forget about you! You seem to have an endless supply of man-candy. Maybe you can start a blog called The Man-Candy Store and have nothing but beefcake photos. I think you have a gift for finding them. I remember his face from The Bachelor but I can't remember his deal. I certainly didn't know he'd gone on into commentating! He's cute! I vaguely remember him from the Bachelor. When I was in HS I was what was called a "Tigerette". We were a dance squad a bit like the Rockettes, that performed with our very large HS Band. The Patriots hired us to perform their half-time show. You don't know how BIG those guys are until you stand on the side of the field with them. They are like oak trees. I <3 College football too. I would totally have Rolando McClain's babies.